The Bellbrook student section gets rowdy as Golden Eagles senior Maria Mescher and junior Kayla Paul execute a trap off of a full-court press defense forcing a turnover, Jan. 26 against Southwestern Buckeye League opponent Oakwood. Bellbrook junior Gigi Painter passes to the corner for an open three against visiting Oakwood. The Golden Eagles scored their first 15 points off 3-pointers in Saturday’s home win. 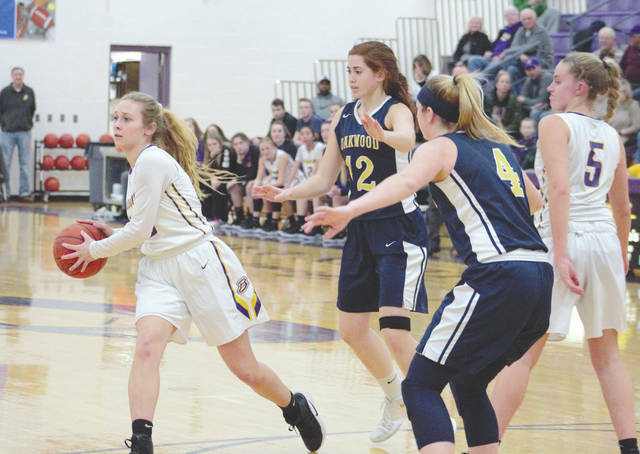 BELLBROOK — The Bellbrook Golden Eagles high school girls basketball team got out to a scorching hot start from behind the arc to start the game. Bellbrook dominated the Oakwood Lumberjills by a score of 57-21. The Golden Eagles’ first five field goals were from three-point range. They hit six threes in the first quarter and 12 total threes in the game. With the team consistently hitting from deep, the student section was going crazy. The shooting, mixed with an effective full-court press defense, gave Bellbrook a sizable early lead. The team jumped out to a 21-2 run to start the game. By the time Oakwood had adjusted, it was too late. Bellbrook never looked back. Maria Mescher led the Golden Eagles with 23 points, including five threes, and Dani Westbrock pulled down 10 rebounds. Lauren Hapgood was the top scorer for Oakwood (9-8, 4-6 SWBL Southwestern) with nine points. The Jills play at Greenon for a 7:15 p.m. game on Tuesday, Jan. 29 next. The win gave Bellbrook an 8-9 record (6-3 in the Southwestern Buckeye League) as they look to finish out the season strong. Currently in third place in the seven-team Southwestern division, Bellbrook’s next game is scheduled for a 7:30 p.m. start, Thursday Jan. 31 in Germantown against SWBL foe Valley View. 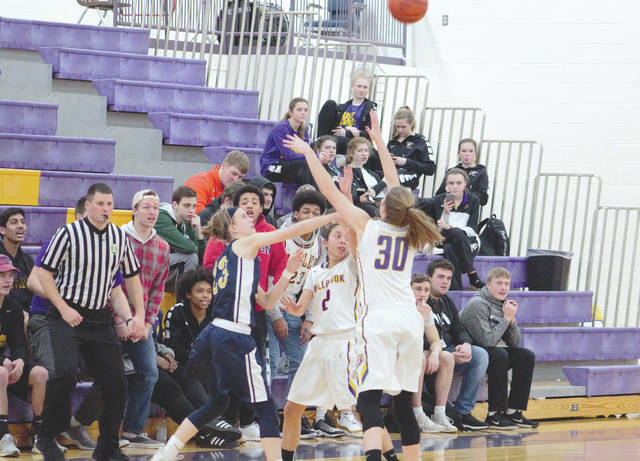 https://www.fairborndailyherald.com/wp-content/uploads/sites/50/2019/01/web1_MescherPaulTrap_PS.jpgThe Bellbrook student section gets rowdy as Golden Eagles senior Maria Mescher and junior Kayla Paul execute a trap off of a full-court press defense forcing a turnover, Jan. 26 against Southwestern Buckeye League opponent Oakwood. https://www.fairborndailyherald.com/wp-content/uploads/sites/50/2019/01/web1_PainterPass_PS.jpgBellbrook junior Gigi Painter passes to the corner for an open three against visiting Oakwood. The Golden Eagles scored their first 15 points off 3-pointers in Saturday’s home win.